Extreme Craft: Get on the Mike! Along with a bazillion of my fellow hopeless record geeks, I became entranced by the thread on Soulstrut.com about Mingering Mike a few years back. When deejay Dori Hadar was digging through some crates at a flea market, he started finding dozens of titles by "Mingering Mike", a soul singer he hadn't heard of before. He hadn't heard of Mingering Mike because the artist was the fictional alter-ego of a lonely teenager in the 1960's who handcrafted hundreds of albums, drawing the sleeves and inserting cardboard records--even adding shrinkwrap to a few. 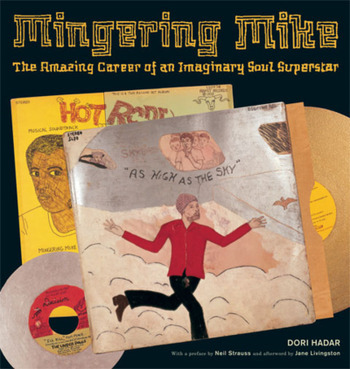 With a little detective work, Hader tracked Mike down, and a friendship blossomed which resulted in a new book, released by Princeton Architectural Press, entitled "Mingering Mike: The Amazing Career of An Imaginary Soul Superstar". The book, as one might expect, is lavishly illustrated and annotated. This, my friends, is nothing less than the music world equivalent of the "discovery" of Henry Darger--only this time, you can befriend Mingering Mike on MySpace. Also, check out mingeringmike.com. In these days of media buzz about virtual worlds like Second Life, it's good to know that there is a continuum of in-depth fantasy worlds that has always existed.